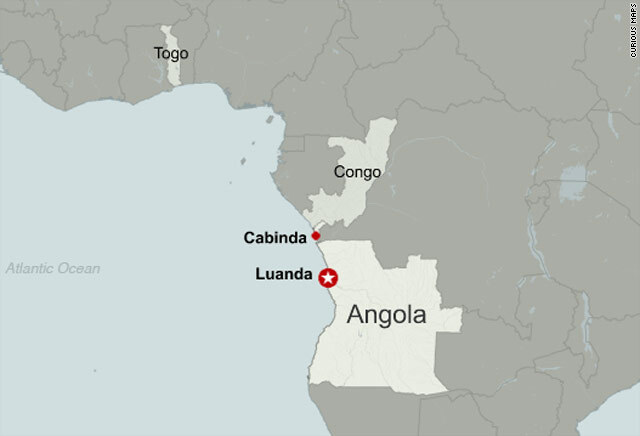 (CNN) -- Angolan authorities have arrested two people in an attack on the Togo national soccer team that left three dead, state media reported. The men were captured at the same location in the state of Cabinda where the bus carrying the soccer team came under fire on Friday, the Angolan Press Agency said Sunday. It did not say when they were arrested. The suspects were said to be members of the Forces for Liberation of the State of Cabinda, an armed wing of a separatist group that has claimed responsibility for the attack and has threatened to strike again. Cabinda is a disputed oil-rich enclave in the Democratic Republic of the Congo and is the site of eight matches in the African Cup of Nations tournament, to which the soccer team was headed. The tournament is one of the biggest sporting events in the world this year, and Angola's first since a 2002 peace deal ended decades of civil war in the southern African country. 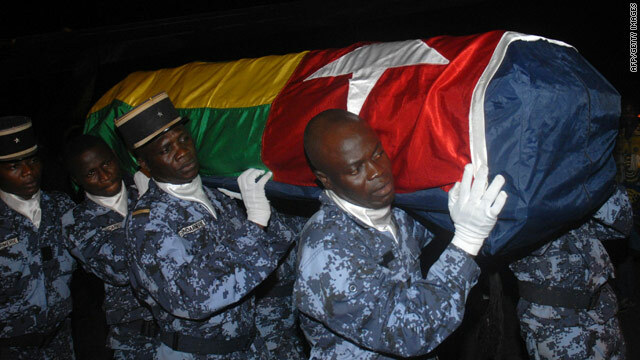 The president of the Confederation of African Football sent "his most heartfelt condolences" to Togo Monday. Issa Hayatou expressed his sympathy "on behalf of the entire African football family" in a letter to Togo's President Faure Gnassingbe, the confederation announced. Hayatou went to Cabinda personally following the attack, the sports body said. The confederation will observe a moment of silence in memory of the slain Togolese before each match in the first round of the tournament, it announced Monday. Togo striker Thomas Dossevi said rebels opened fire on the team bus with AK-47 assault rifles. The gunfire killed the team's assistant coach, its communication officer and the bus driver. At least seven others were wounded, including goalkeeper Kodjovi Obilale. Erin Smylie, a spokeswoman for the South African hospital that has been treating Obilale, told British newspaper The Daily Telegraph the 25-year-old remained "stable but ventilated and sedated to assist with recovery." After the ambush, Togo's government said the squad had to return home, though the team had indicated it would like to play. "It's disappointing that Togo left, but it was a difficult decision," said Kwesi Nyantakyi, president of the Ghana Football Association. Do you think athletes are an easy target for attack? Togo was to play Ghana on Monday. "I saw them. They were really down. We tried to console them and encourage them. Their departure was a definite blow to the competition," Nyantakyi said Monday. Angolan officials -- trying to assuage security fears that could dampen the nation's sporting aspirations -- vowed to heighten security, particularly in Cabinda. "'The security has definitely improved since we arrived here on Thursday," Nyantakyi said. "There are helicopters flying in the air, patrol teams in the host venue. ... We have security all the time, even at the hotel."